Back to School with BELL Backpacks! 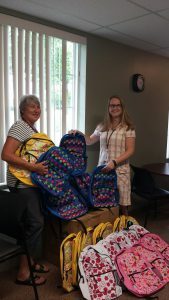 Thanks to Bell, 100 children receiving services from the Kawartha-Haliburton Children’s Aid Society will head back to school in a few weeks with brand new backpacks! It is amazing to pass along this wonderful donation. The Foundation is so grateful for the continued support of Bell with such timely help again this year! Thank you Bell. Next Next post: 23rd Annual Dream Ball!